The world's largest businesses know that storing hard drives, backup tapes, external drives and other digital assets on-site, even in a so-called "fireproof" safe, is not a smart move—and it's not worth the risk. And taking it home with you solves one problem but creates two more. Find out what the big firms do to protect their data, and how little it costs compared to the potential nightmare alternative. 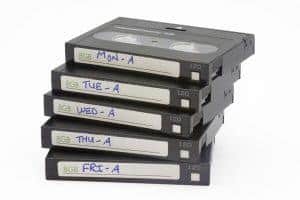 Taking Tapes & Hard Drives Home? The "poor man's" version of tape and hard drive rotation occurs on Dallas streets and highways every night, and it's an absolute shame. TRexShred's sister company, Corporate Records Management (CRM), offers such affordable options that you will have NO DEFENSE if your clients', patients' or customers' information is breached because you chose "DIY" data protection. 1. You doing it wrong, if you're even doing it at all. In our many years of experience, we have encountered only a handful of owners and managers who actually follow through on a sound disaster recovery plan with backup tapes. For every one who does it right, there are 50 more who fall somewhere between fair and poor on the frequency scale. The one that gives us nightmares is the all-too-common scenario of leaving backup tapes on the top of the server rack. If that's you, or you can't quite seem to keep yourself honest, please call us at 214-333-3453 today. What happens when you're on vacation? What happens when you need to lay off the manager that stores your backup tapes at their house? How do you even know if they are actually following protocol and not just leaving the tapes in their trunk all weekend? 2. You are exposing valuable data to "accidental" thieves. Okay, you're doing the whole "taking it home" thing every night, every Friday, and every month-end, but you're using your own car, briefcase, backpack or box, and therefore taking too much risk. Cars like yours get broken into a lot more than you'd like to think, and you don't/can't always drive straight home. And you certainly can't secure those tapes and drives in a purpose-built data vault like CRM does. Laptop bags are stolen more than practically any other thing you own. Once in your home, the likelihood of theft is a real threat as opposed to storing in a data vault like ours. Also, a thief immediately knows—or can easily find out—the origin of backup tapes taken from your house (if you weren't specifically targeted already) compared to the anonymity of thousands of barcoded, nearly-identical tapes and tape cases at CRM.